The U.S. Congress is typically seen as an institution filled with career politicians who have been seasoned by experience in lower levels of political office. In fact, political amateurs have comprised roughly one quarter of the House of Representatives since 1930. The effect of amateurs’ inexperience on their political careers, roles in Congress, and impact on the political system has never been analyzed in detail. 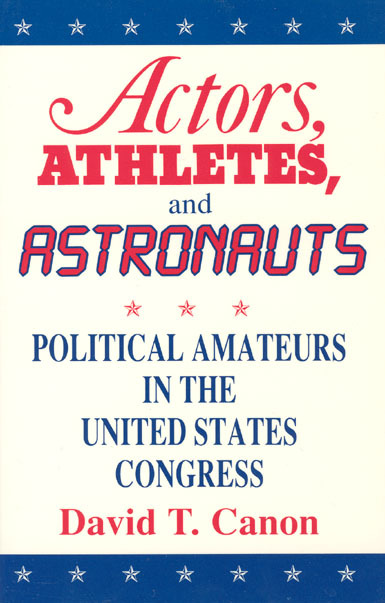 Written in a lucid style accessible to the nonspecialist, David T. Canon’s Actors, Athletes, and Astronauts is a definitive study of political amateurs in elections and in Congress. Canon examines the political conditions that prompt amateurs to run for office, why they win or lose, and whether elected amateurs behave differently from their experienced counterparts. Challenging previous work which presumed stable career structures and progressively ambitious candidates, his study reveals that amateurs are disproportionately elected in periods of high political opportunity, such as the 1930s for Democrats and 1980s for Republicans. Canon’s detailed findings call for significant revision of our prevailing understanding of ambition theory and disarm monolithic interpretations of political amateurs. His unique typology of amateurism differentiates among policy-oriented, "hopeless," or ambitious amateurs. The latter resemble their professional counterparts; "hopeless" amateurs are swept into office by strong partisan motivations and decision-making styles of each type vary, affecting their degree of success, but each type of amateur provides a necessary electoral balance by defeating entrenched incumbents rarely challenged by more experienced politicians.